This week’s challenge at Hand Stamped Sentiments is a color challenge with the colors of Blackberry Bliss, Pear Pizzazz and Black. These colors were perfect for a Halloween card. 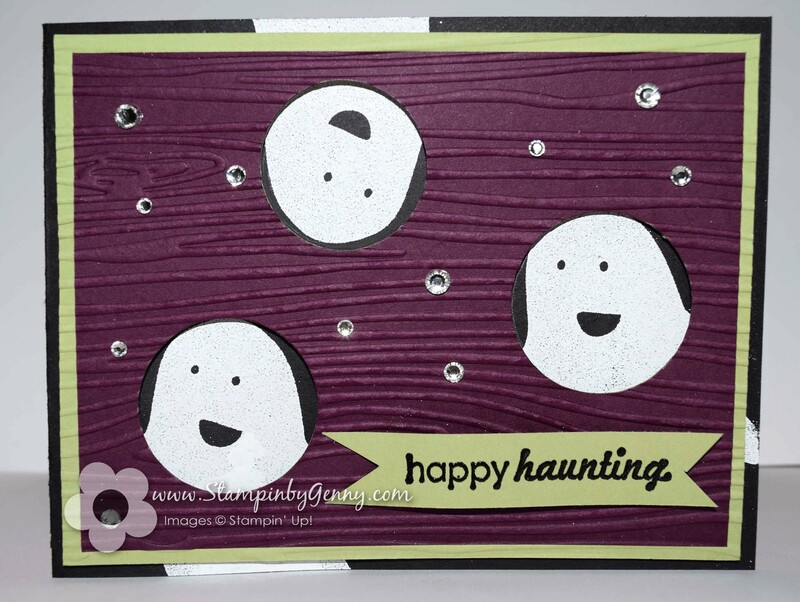 I used the ghost from the Fall Fest stamp set and greeting from the Ghoulish Greetings stamp set. For texture I used the Woodgrain Embossing folder and embellished with rhinestones. I adhered the Blackberry Bliss and Pear Pizzaazz layers then punched the circles through both layers. I stamped the ghosts with Versamark on the black layer and heat embossed with white embossing powder. The sentiment is also stamped in Versamrk and heat embossed with black embossing powder. Super easy card to make! Hop on over to Hand Stamped Sentiments to see more what our creative design team has whipped up using these colors. I hope to see your creation at HSS. Those little ghosts peeking are so cute! Love it! I LOVE the peek-a-boo spots, super cute!! I have to try that on a card so bad, love love love it! !